The expression “the more, the merrier” has never been more apropos as indie game developers Those Awesome Guys announced today that the Move or Die “Viewers vs Streamers” free content update is available today. Packed full of goodness including the new Heavy Bullets game mode, Teleport Mutator, and playable characters like renowned indie game hero Shovel Knight, the update also adds the highly anticipated Twitch Mode, enabling – for the first time – Twitch viewers to play with livestreamers in Move or Die. QWERTY Bombs is one of the unique Twitch Mode special events that viewers can control! Balance – Players spawn on a platform above a floor made out of death tiles, and chat members control the direction the platform is tipped, causing the players to slide off of it and die. DropKill – Each player spawns on their own platform that is slowly descending into death tiles and viewers vote to raise a specific platform for each player delaying death. Lasers – The top of the room is armed with huge lasers that are triggered by Twitch chat room votes. When enough votes are tallied, LASERS WILL FIRE! 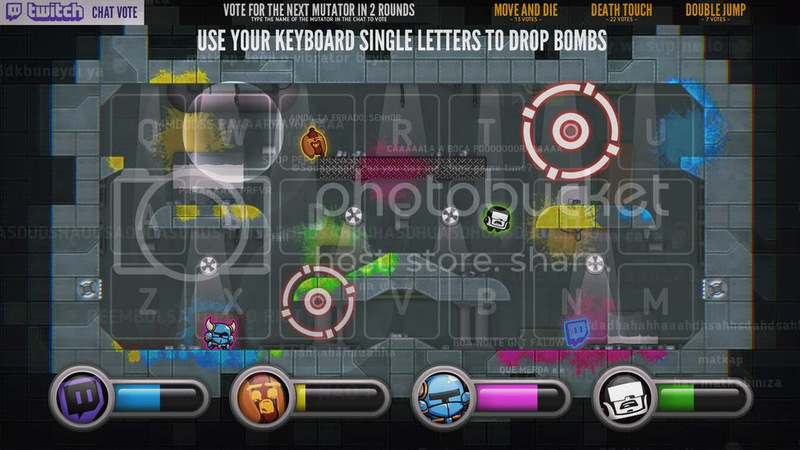 QWERTY Bombs – A keyboard layout is mapped on the screen and the viewers can type any letter to launch a bomb that explodes in-game. Heavy Bullets – New game mode where each player gets an empty gun and two bullets are randomly spawned. Collect the bullet in order to fire the gun, but watch out as the bullets have a “heavy” short-range trajectory and missing will allow the bullet to be picked up by an opponent! Teleporter Mutator – The new Mutator enables a player to teleport a brief distance forward while in mid-air – even through doors and walls! Added Playable Characters – Seven new characters including Glitch from Twitch, Tankman from NewGrounds, and Shovel Knight! New Game Announcer – The melodious voice of Arin (EgoRaptor) from Game Grumps joinsMove or Die Announcers list! Hi mom! Move or Die is available now on Steam for $14.99. To learn more about Move or Die, please visitwww.moveordiegame.com, ‘Like’ it on Facebook, and follow its development on Twitter@moveordiegame for all the latest developer updates and news.